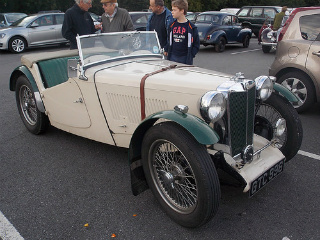 The MG TA Midget sports car was launched in 1936. 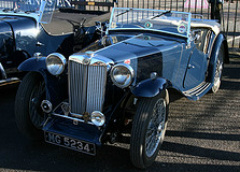 It was a natural evolution from the MG PB it replaced, being three inches wider and with a seven inch longer wheelbase. The PB's 847 cc, 4-cylinder, overhead cam engine was now replaced with a 1.3 litre, 4-cylinder, overhead valve unit, as used in the Wolseley 10 saloon, with a compression ratio of 7.5:1. It was a two door, two seater convertible, and used a steel body attached to a wooden chassis made of Ash. It was fitted with a bench seat behind which was a limited amount of storage space. For those who wanted a little more luxury, one option was a Tickford drop head coupe body. Some 252 MG TA's opted for this conversion. 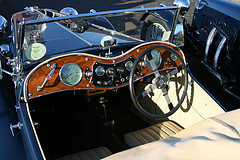 There were three positions in which the Tickford soft top could be operated: fully open, closed, or open just sufficiently to cover the bench seat. Furthermore, there were wind up windows and individual bucket seats on a carpeted floor. 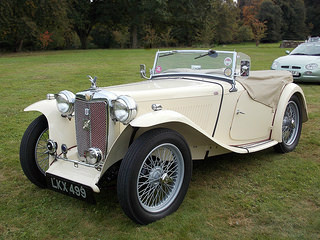 Due to its specifications, the MG TA sports car was an easy car to drive, which helped to create the appeal of a sports car to a much wider audience than before. As its popularity grew, the TA was entered into competitions. However, the engine cold not cope with being driven at high revs due to inappropriate valve timing and weak big end bearings. The solution to this problem was when MG created ways to tune the engine, and to make the information available to everyone. When first launched, the TA was known as the T-Type. However, following the introduction of its successor, the MG TB, the TA designation was created. 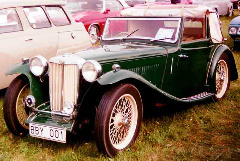 In 1939, the MG TB Midget was introduced. Its predecessor, the TA, inherited a poorly performing engine. However, the TB was given the more efficient XPAG engine, with two SU carburettors, specially designed for the TB, and with the ability to be easily tuned. This was a new 1.2 litre, 4-cylinder, overhead valve unit, already in use in the Morris 10 saloon. The cylinder head had been redesigned, there was improved valve timing, and it had stronger big end bearings to withstand the stresses of high revving. It was available as a two door, two seater convertible. A more luxurious Tickford drop head coupe was offered as an optional extra. Unfortunately, the onset of WW2 brought production to a halt with only 329 MG TB's being built. 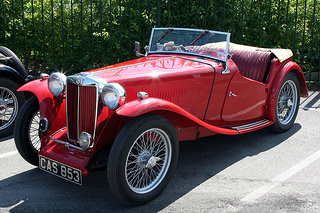 In 1945, the MG TC Midget sports car was launched, and was the first post WW2 MG to be built. The ads at that time extolled the virtues of the TC by saying it was "The sports car America loved first". It was, of course, referring to the fact that, whilst in Europe, American troops would come to love European sports cars. An interesting fact was that, in the first year of production (1945), some 80 MG TC's were built, which was quite astonishing since WW2 had only just ended in May of that year. It was available as a two door, two seater convertible. The TC was very similar to its predecessor, the TB, using the same 1.2 litre, overhead valve, pushrod operated XPAG engine, with two SU carburettors, but with the compression raised slightly to 7:5:1. It used a four speed gearbox with synchromesh on the top three gears, hydraulic nine inch drum brakes all round, and a solid rear axle. Following WW2, people were, once again, eager to get back to motor racing. In this respect, MG was helpful by providing engines with a variety of different stages of tuning. The US was a major source of export potential, and the fact that only right hand drive roadsters were built, did not seem to make any difference. The export model incorporated slightly smaller sealed beam headlights, larger rear lights, turning indicators, and chrome plated bumpers at the front and rear. Compared with the TB, the body of the TC was about four inches wider at the doors to create more room on the bench seat. However, this meant that the running board was slightly narrower, resulting in there being two tread strips instead of the previous three. Curiously, the rev counter was positioned in front of the driver, but the speedometer was placed at the other end of the dashboard in front of the passenger. 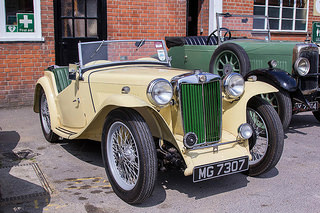 More MG TC's were sold than any previous MG roadster. 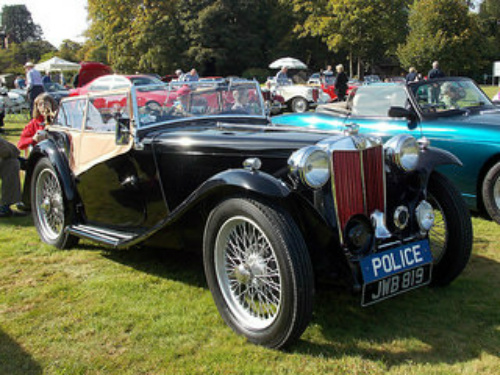 Depending on condition: A 1936-39 MG TA would sell for between £25,000/$40,000 and £40,000/$64,000. A 1945-50 MG TC would sell for between £28,000/$45,000 and £40,000/$64,000.